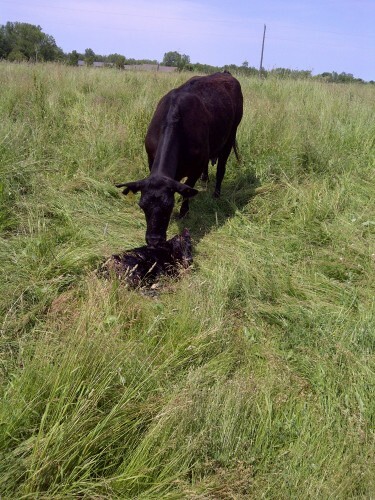 One of our cows tending to a newborn calf. We have been raising cattle on the farm for about 7 years (after a bit of a hiatus). We raise our cattle naturally, without antibiotics or growth hormones. The cattle enjoy the pasture during the day, and the barn at night, and we enjoy chasing them around after they create a new hole in the fence. Our cattle are mostly Angus or Angus-Cross. Since 2010 we have been raising a small cow-calf herd at our farm near Zurich. We got into that aspect of farming by accident, but have enjoyed seeing the young calves running around with their mothers. The bull is a proud papa, always watching over the herd. Our beef is available at the farm and at the farmers’s market, and can be bought by the half or quarter, customized to your specifications. Our butchering is done at a locally, near Dashwood.